Most of Gambia's population work for peanuts, which constitute 95% of its exports by value. Previously its chief industry was slave trading , which should serve to remind us that working for peanuts is better than some of the alternatives. Gambia occupies a 200 mile long strip of land in west Africa along both sides of the Gambia River. Apart from a coastal strip at the junction of the river with the North Atlantic Ocean, it is completely surrounded by Senegal, with which it was once joined. From its discovery by the Portuguese in the fifteenth century it was part of Mali, but was bought by the British in 1588, and the first colony Fort James was established in 1664. At one time it was united with Sierra Leone, but became a British Colony in 1888, achieving independence in 1965 as a constitutional monarcy within the British Commonwealth. It became a republic in 1970, remaining in the Commonwealth. It formed a confederation with Senegal in 1982, but this was disolved after a military junta took control of Gambia in 1994, although it has nominally returned to civilian rule in 1996. Gambia shared the coinage of British West Africa with Sierra Leone, Nigeria, and Gold Coast (now Ghana) from 1907 until 1966, when it issued its own coins. Gambia's has only issued gold coins since 1995, and these are all commemoratives. 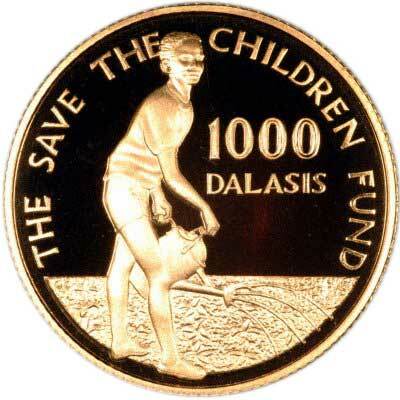 Although the lowest value gold coin issued is a 20 dalasis, a 10 dalasis coin is issued in base metal. Whether this harks back to the old slave trade days when the price of tender lassies was ten dalasis, we can only guess. We also guess that the word dalasis derives from a local dialect pronunciation of the word dollar, and therefore also from thaler as in Joachimasthaler. If anybody has any further knowledge on this point, we would appreciate your contribution. 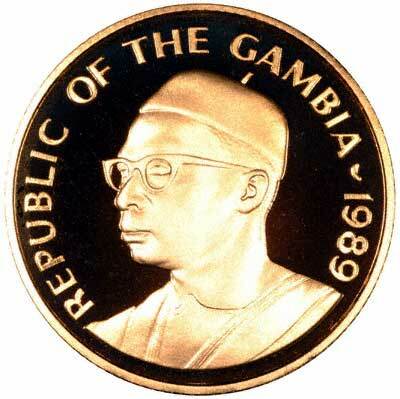 For silver and base metal coins of Gambia, please look at our original Chard Coins website. We make an active market in almost all world coins, gold or otherwise, including Gambian gold coins. If you have any of these coins to sell, please contact us, or post them to us for appraisal and offer.